This article is about territorial occupation. For the ranks and positions, see military rank. "Occupied Territories" redirects here. For Palestinian territories occupied by Israel, see Occupied Palestinian Territories. For other occupied territories, see List of military occupations. 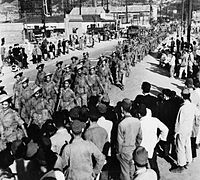 Wikimedia Commons has media related to Military occupation.